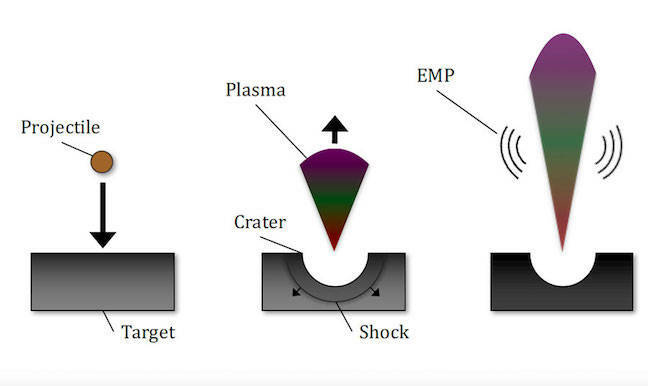 Space scientists have long known that impacts too small to pierce a craft's skin can still damage the electronics inside, by creating electromagnetic pulses. Why those pulses happen, however, is still not well understood. Alex Fletcher of Boston University and MIT, and Sigrid Close of Stanford University reckon they've cracked that mystery: the radio emissions come from the behaviour of a plasma caused by the collision. If a dust particle is travelling fast enough – say, between five and ten kilometres per second – it produces a shock wave that expands into the surface of its target, and material gets vaporised and ionised. The plasma starts so dense it's almost a solid, and as it expands, ions and electrons spread at different speeds (the lighter electrons move away faster). The relative velocity of the different electrical charges is what causes the brief RF pulse. Close, the senior author of paper titled "Particle-in-cell simulations of an RF emission mechanism associated with hypervelocity impact plasmas", in the journal Physics of Plasmas, has been working on the question since 2010, when she and some colleagues first hypothesised that at least some satellite failures are caused by hypervelocity collisions. As Fletcher says in this American Institute of Physics release, more than half of satellite electrical failures remain unexplained, which is why researchers are keen to explain the RF pulses. There's still more work to be done, because the simulations produced higher frequencies than those boffins have to date observed. Reg Lecture Praying that there's intelligent life somewhere up in space?